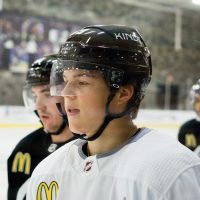 Yesterday afternoon, Los Angeles Kings coach Terry Murray announced he was going with a more veteran line-up tonight vs. the Anaheim Ducks – with Andrei Loktionov as the lone prospect included in the group of forwards. 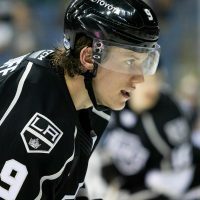 After talking a look at prospects Brandon Kozun, Tyler Toffoli and others vs. the Phoenix Coyotes, they’ll sit out tonight’s contest. 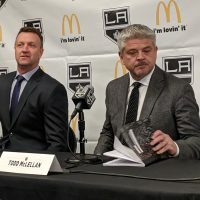 Two of the other defensive prospects getting the bulk of attention so far, Thomas Hickey and Slava Voynov, will both patrol the blueline again, as they did on Wednesday at Staples Center. 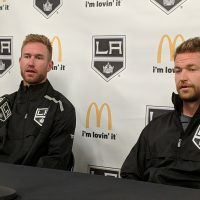 The longer Drew Doughty isn’t signed – and if he plans on joining the team in Europe, he needs to be in camp by Friday at the latest – the more likely one of those two will be in the starting line-up on opening night. 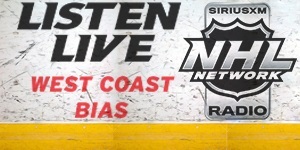 Coach Murray evaluated the play of both in an interview here. Later this afternoon we’ll have a preview of the Kings-Ducks game and information on how to watch the game online tonight for free.